We were pleased to discover that the TMNT franchise hasn’t undergone a total overhaul for the new CGI Nickelodeon series, and ergo this timely tie-in. Other than a handful of minor changes – such as Baxter Stockman now stomping around in a mech-suit rather than turning into some grotesque man/fly hybrid – they’re still the same heroes in a half shell that we knew and loved back in our youth. The absence of the dim-witted duo Bebop and Rocksteady is somewhat regrettable, but we’ll get over it. It’s a shame that the formula behind the numerous Turtles tie-ins hasn’t moved with the times. Ever since Konami released their classic coin-op way back in 1989, it would appear that they’ve been typecast as simplistic side-scrolling brawlers no matter what publisher holds the license. Just like the arcade original from all those years ago, the two-button combat system is beyond basic. So much so that there isn’t even a block button. Enemies emit a red glow when they’re about to attack, but there’s no way to dodge, counter or evade. All you can do is walk away like some sort of reluctant hero. The only real flourish as far as combat is concerned is the ability to grab enemies and throw them into the screen. 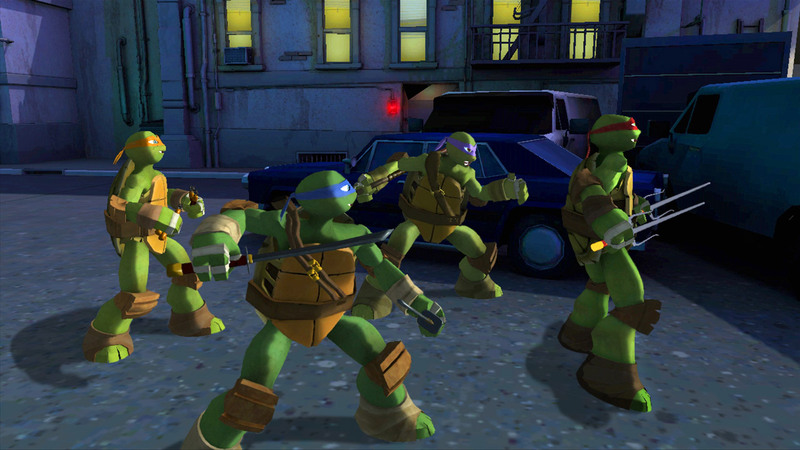 Developers Magic Pockets obviously have a soft spot for the SNES’s Turtles in Time. A score multiplier system has been implemented, but when playing on your lonesome it’s totally redundant. The combat upgrade system is similarly sloppy – we managed to unlock every single combo by the end of the second level, leaving just the health and attack damage upgrades. The chance to play online could have saved the scoring system, but being a budget effort online co-op play clearly wasn’t on the ‘to do’ list. 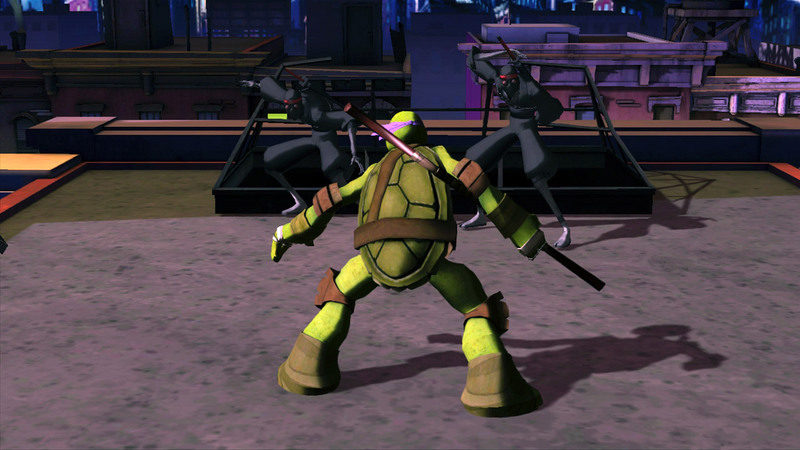 Heck, we wouldn’t be surprised at all to learn that the development budget was lower than that the recent XBLA brawler TMNT: Out of the Shadows. 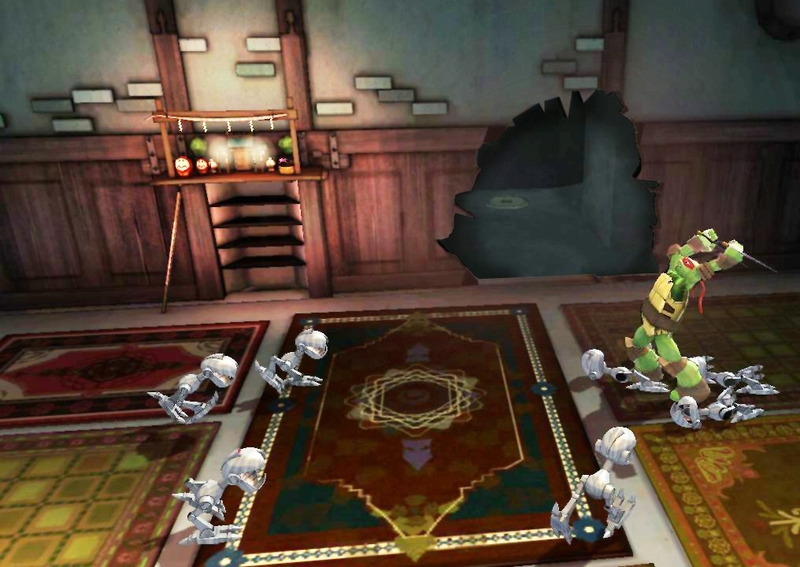 Even if this was an Xbox 360 launch game it would have looked outdated – backdrops can only be described as sterile, animation appears unfinished and character models are on the scruffy side. There’s so little passion for the license on display that Activision may have as well asked the Cabela’s Dangerous Hunts studio to have handled it. Basic combat, basic story. 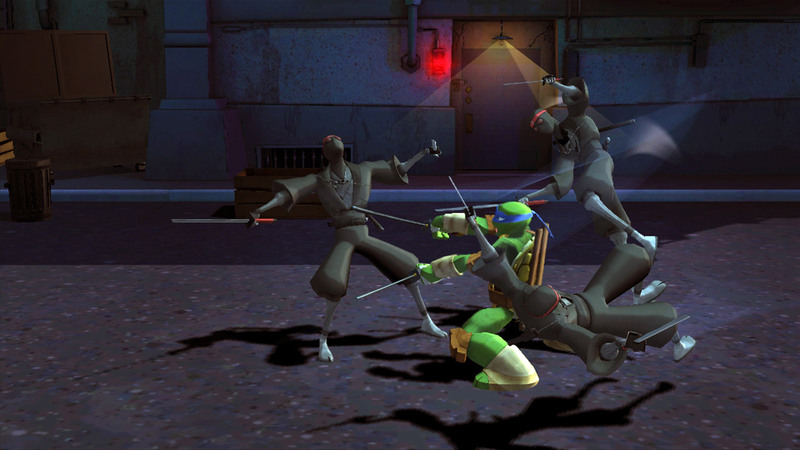 Shredder plans to activate a Mutagen bomb, and so the green skinned foursome travel across NYC taking on the might of the Footclan before eventually arriving at Shredder’s doorstep. Baxter’s army of robotic Mousers and the Krang – who are now a race of brain-like aliens rather than single being – make up the rest of the enemy assortment, while around halfway through Dogpound and Fishface show up for a boss battle. If their clichéd attack patterns weren’t enough, you’re informed how to beat them before the battle even starts. To further enforce the fact that this is a game for the very young, dying is such a rare occurrence that we aren’t even sure if there’s a ‘Game Over’ screen, while many of the ‘hidden’ collectables are placed in clear view. Unbelievably, it gets worse. When not under your control the AI takes over the surplus Turtles on screen. The AI is so rudimentary that they’re quite happy to stand still on the spot while watching you get smacked about, only attacking if an enemy engages with them first. If the AI falls behind by even a couple of yards then they magically re-appear ahead, only to then get left behind again almost straight away. Somewhat hilariously, they will even walk straight into the spinning blades that pop-up out of the floor during one of the later levels. Despite the game’s pitiful 3-4 hour length, a few sections have been lazily recycled with not one but two levels taking place on top of the Turtle’s ‘Shellraiser’ vehicle. Speaking of recycling, the speech samples – some of which are incredibly muffled – begin to repeat and thus grate as soon as an hour into the adventure. Even if this was a £6.95 (or 800 MSP, if you prefer) Xbox Live Arcade game it would have been a hard sell, so the fact that Activision are expecting parents, children and long time Turtles fans alike to spend £25 on it is bit of a joke. Let’s spare a thought for those who are going to open their stocking on Christmas day and find a copy of this overwhelmingly blatant cash-in inside.